Welcome to the Craftwell USA/ Sabor Papel Blog Hop!! I am super excited you are here!! thank you for hopping with us today!! If you have Just come from Debi Tullier's Blog, you are in the right place! I started by coloring this panel Sabor Papel's Recuerdos Amor paper. 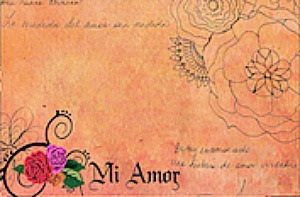 A lot of Sabor's paper in the Amor Collection have an array of flower doodles on them... these make for great coloring. And coloring has become quite an awesome trend that I was just too happy to embrace. I just love to color! It relaxes me and makes me feel like a kid again! 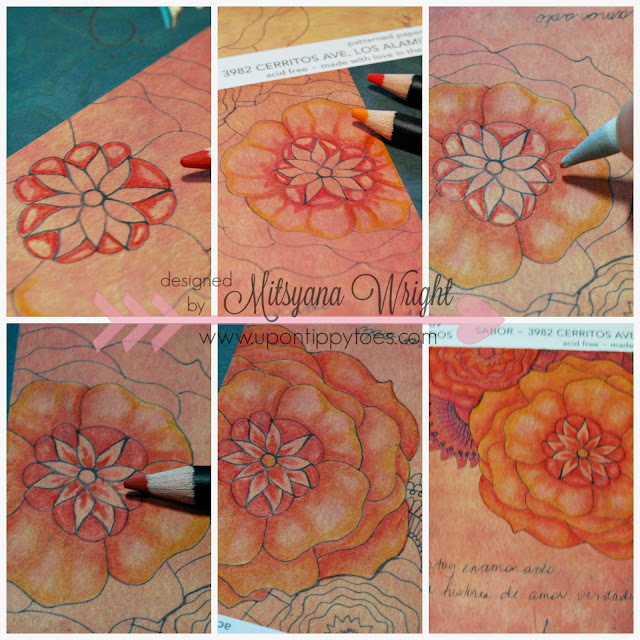 I chose to color my flower images using color pencils and odorless mineral spirits with blending stumps. I traced around each image then blended out the color with my solution and stumps. I kept going back and adding layers and shadows where I thought they would fall on the flower. Look at the huge difference a bit of coloring makes!! On the left are the flowers I colored with my color pencils and mineral spirits... and on the right is an uncolored flower doodle. I love how much depth it adds! And for some reason, I found it much more easier to color a colored sheet of paper versus a plain white sheet. 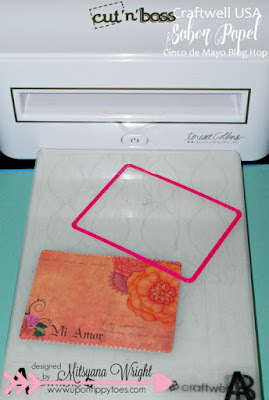 I cut my panel out using my Cut'n'boss and a stitched rectangle die. If I stopped at this point it would make a really beautiful post card... don't you think?! But I can't leave well enough alone... so, I also cut out a mat for my panel to continue to build a card. Then, I ran both through my Xyron Creative Station. 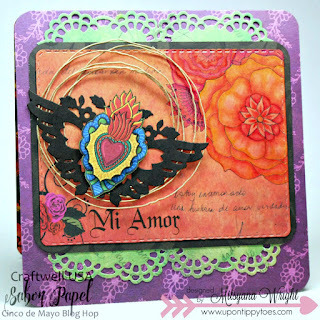 For my little heart embellishment I cut out 2 different sized flaming hearts from more Sabor paper. I added foam adhesive to the back of each and layered the smaller on top of the bigger one. 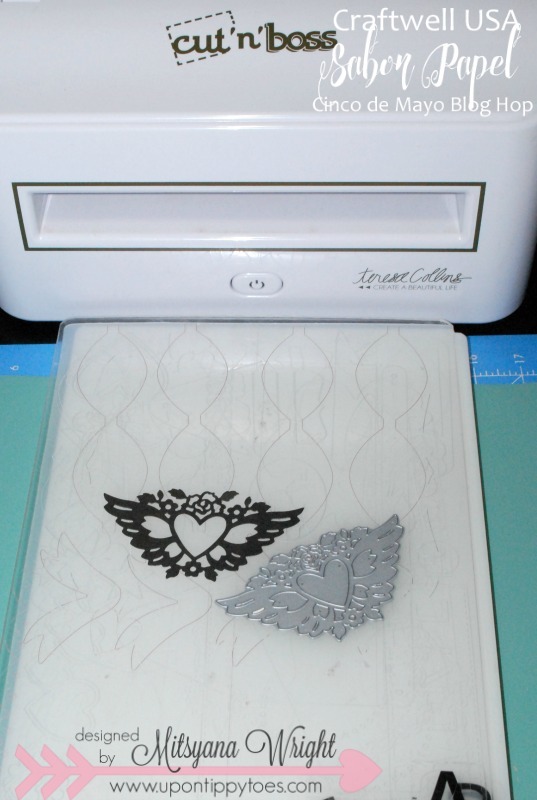 Then I cut out this really cool winged heart out of plain black cardstock and layered my hearts on top of them. 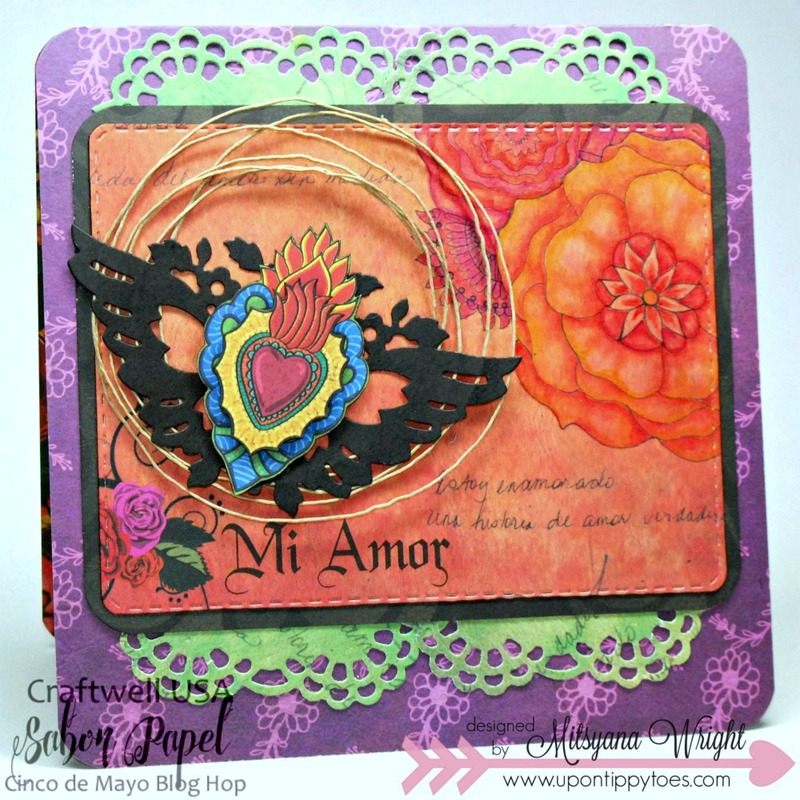 For the green frilly trim I used the sentimientos amor paper and my Teresa Collins die to cut out a doily. 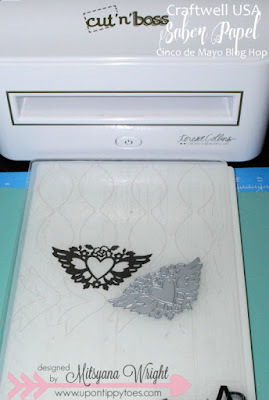 Then I cut the doily into four pieces (above), and added adhesive using my Xyron Mega Runner. I tucked the corner under my matted panel and attached it to a 6"x6" card base made using the Ramitos paper. Then I wound some hemp twine and attached to my card front using my winged heart. And here's my finished card!! I just love how this turned out!! And my favorite part was coloring this gorgeous flower doodle!! 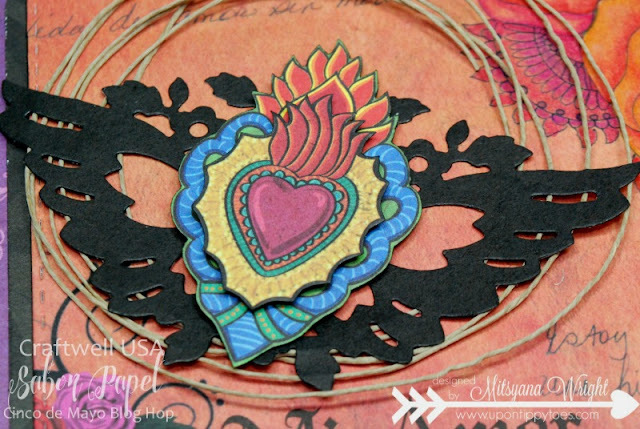 But the very close second place was making the very cool heart embellishment! 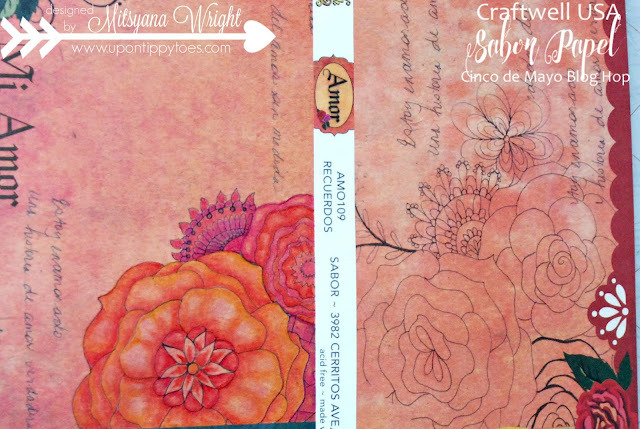 I hope you loved my project and that it inspire you to color your doodles too!! Remember, we will giving away some awesome prizes!! 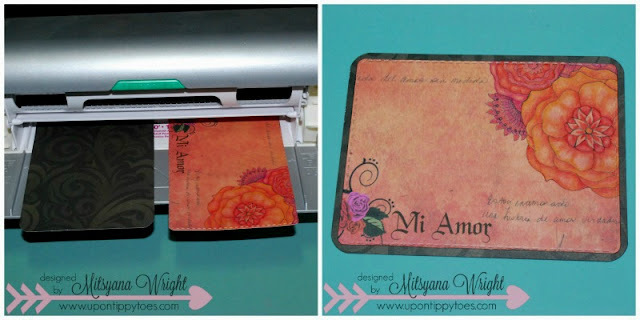 Prizes for Cinco de Mayo Blog Hop include one eBrush, set small embossing folders, a package of paper from Sabor and two packages of papers from SantanaCrafts , and then a 25 dollar store voucher from Latina Crafter. We will have six winners! In order to enter the giveaway, you must leave a comment on all participating blogs. Please like the Sabor Papel and Craftwell's facebook pages but you are not required to. You can comment once on each blog thru the 8th of May . Winners will be chosen at random from the comments left on all of the blogs. We will check to make sure all of the rules are followed. The comments will close at 11:59 PM PST on Sunday May 8, 2016. Must be in the US or Canada to be eligible to win. 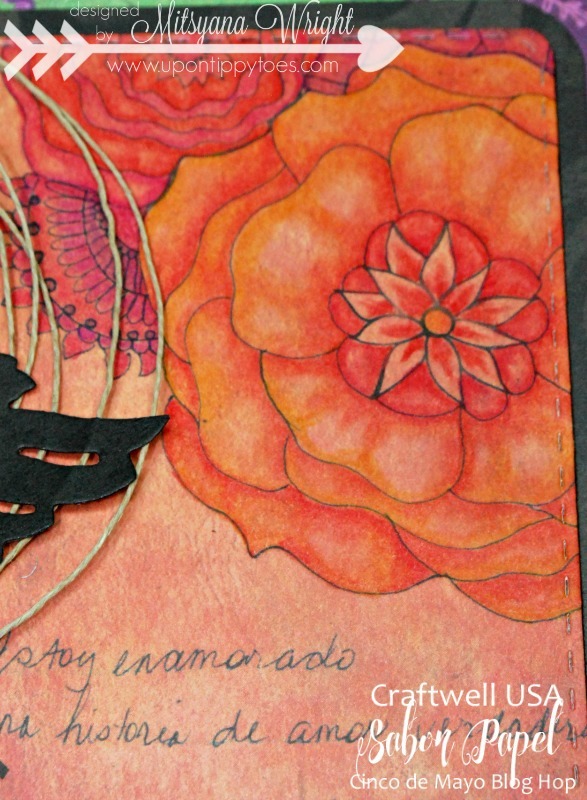 The winner will be announced on Monday, May 10th on the Craftwell and Sabor Papel blogs. So don't forget to visit all the other awesome blogs in today's line-up!! Hope you have a wonderful time hopping with us!! Beautiful!! 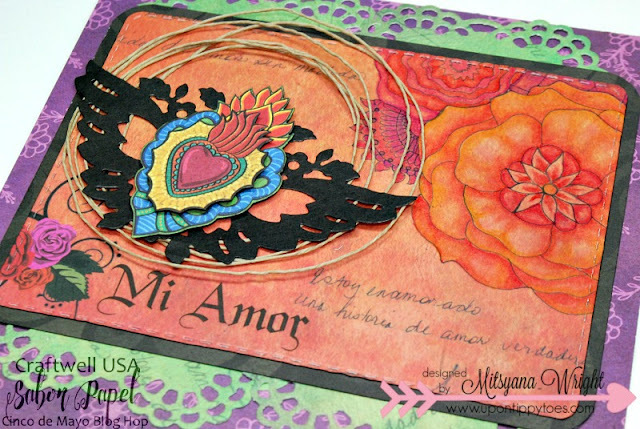 Love that you colored the flowers and love the use of that doily!! What a difference. You colored beautiful. Great job on the coloring of the flowers. Very pretty card. I love the idea of coloring in the page! Great Job i love the colors! Love how you colored the flowers! Gorgeous! I love the Cut'n'boss and Teresa Collins dies. I have to check and see if I have this die! That came out beautifully! I need to get the winged heart die! Gorgeous make I love your coloring! Beautiful card, your coloring is amazing! Every time I come to your blog, I am amazed by your creativity, you always make the most unique cards! I love all of the details and layering! Awesome job on this my friend! Hope you are doing well! Hugs! love that extra punch of coloring the paper, Mitsy! Awesome project! Love the coloring it really makes the flower pop. What a happy and beautiful card. I love the way you colored the flowers. Thanks for the inspiration!! your flower came out sooo awesome!!! love this idea!!! Stunning!!! Fabulous 3D effect with so many beautiful elements! Great background! Amazingly stunning! Love the elements that were place exactly perfectly! Very festive and pretty! Love the color combo!